Lance Cpl. Trevor Wiren gains biometrics using the HIIDE (Handheld Interagency Identity Dectection Equipment). 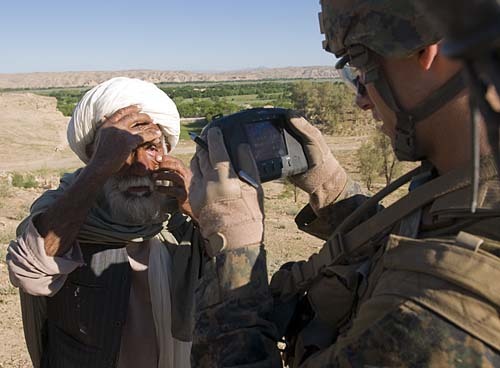 Third Platoon, Dog Company, 1st Battalion, 7th Marines conduct a security and biometrics patrol in the Upper Sangin Valley at FOB Alcatraz in Sangin, Helmand on April 28, 2012.